Cigar smokers have long enjoyed the full, rich, tobacco taste of a quality, hand rolled cigar. Cigars produce thick clouds of smoke, and large amounts of nicotine, in addition to a premium tobacco taste. One aspect of the vaping market seeks to appeal to this class of smokers via e-cigars. While a true cigar enthusiast may be reluctant to be won over by e-cigars, they have many advantages compared to the real thing and should not be dismissed so quickly. Most non-cigar smokers find the smell of genuine cigars to be distasteful and unpleasant. Some e-cigars do have a noticeable odor, but it is much tamer than the real thing, and dissipates quickly. Also, e-cigars do not burn, make actual smoke (it’s vapor! ), or ash. Like their e-cig counterparts, switching could make a big difference in your health. Not developing smoking related diseases, or dying, may be attractive to new users who are interested in cigars, but reluctant to take up an unhealthy habit. Furthermore, e-cigars are welcome in some businesses that do not allow use of the genuine product, such as some casinos. Three notable e-cigars further down the page. Vaping an e-cigar is very similar to how a tobacco cigar is smoked. Cigar smokers generally employ two methods: puffing into one’s mouth or inhaling partly or all the way into the lungs. If one chooses to puff his/her e-cigar, the vapor may be held in the mouth to allow nicotine absorption and then exhaled through the mouth and/or nose. An e-cigar may also be inhaled wholly or partially into the lungs by taking a small draw into the mouth, and then inhaling. This method is referred to as Mouth To Lung (MTL) vaping. The method of drawing on an e-cigar or e-cigarette can differ slightly in feel compared to tobacco cigars, or it can feel about the same. It’s really all up to the user. Most vapers easily adapt with just a bit of practice. A variety of flavor experiences await the user of e-cigars. They are available in traditional flavors like Cuban or Havana, or other traditional, premiere tobacco flavors. Some are available in pipe tobacco flavors as well such as apple, cherry, or vanilla flavored tobacco. Furthermore, for those who wish for something different at times, desserts or fruits may excite your palate. Some e-cigars have refillable cartridges, which opens an amazing assortment of flavors to the user. The traditional cigar, pipe and cigarette flavors vary widely. For those looking to experiment, the world is your oyster. Currently, e-juice comes in nearly every flavor one can imagine: desserts, fruits, beverages, yogurt, waffles, candy. Aside from improving your health by not smoking traditional cigars, perhaps some of these flavors can may even become more appealing than the taste of burning plant matter. Like a traditional cigar, e-cigars have some “give” to them to allow the user to bite down a bit, or even chew the end. Most light up at the tip using a LED to give the appearance of a burning cigar, and from a distance they appear to be genuine. If you are looking to keep the form factor, e-cigars are a godsend! no tobacco and no harmful carcinogenic ingredients. The disposable Robusto by EPUFFER is a super-realistic version of an authentic Robusto analog cigar. 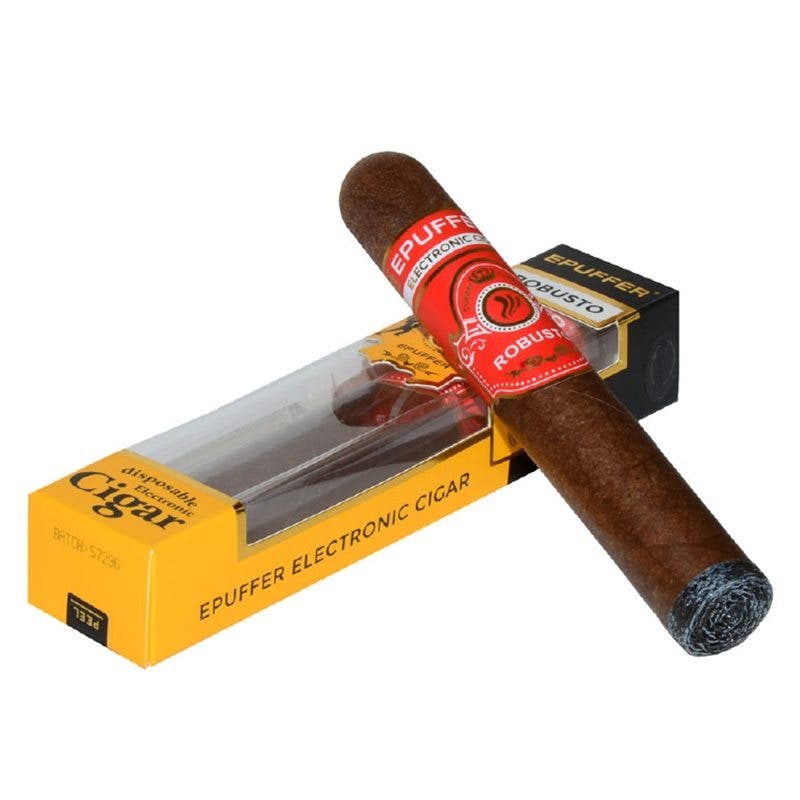 Equipped with a tobacco-like wrapper, that really mimics the feel of a cigar, and a soft tip which enables the user to bite on the e-cigar, it is evident that EPUFFER meant to make the transition from smoking cigars to vaping them as smooth as possible. The biggest thing missing is fire, and, well, tobacco. But since it is disposable, no charger, refill liquid or refill cartridges are needed to keep around as extra stuff. All that is needed for the Robusto to be enjoyed is a puff. The Robusto comes in zero nic, 6 mg/mL and 24 mg/mL. EPUFFER sells a large range of products, from e-cigs to dry herb vaporizers, to e-pipes and even more e-cigars (like the E-650 and the E-900 which are rechargeable and refillable, to a couple more disposables). EPUFER is a one-stop-shop for various types of vaporizers. The E-Cigar King by Vapor4Life is a powerful, hard-hitting e-cigar that can put out a healthy amount of vapor. But probably the most noteworthy aspect of the device is the taste. If you want the taste of a cigar but with vapor instead of smoke, the E-Cigar King is the kit for you.. The taste of the e-cigar e-juice made by Vapor4Life is so spot-on, it defies reason. Even the lingering smell is quite cigar-like, though nowhere near as strong or long lasting. And since the cartridges are refillable–in addition to V4L selling empty cartridges–you can opt for the remarkable taste of V4L’s cigar e-juice, or you can try your hand at the plethora of non-cigar flavors they sell. The E-CIgar King comes in either a 900 or 1300 mAh battery, two color choices, and Cubana (full bodied), Ligero (spicy), or Maduro (mild) flavors. Try this kit, and anything from e-juice to dry herb vaporizers, to a wealth of beginner-type devices at Vapor4Life. V4L is sure to have something for most, and they’ve had it like that for many years. They are one of the original vape vendors that are still going strong today! 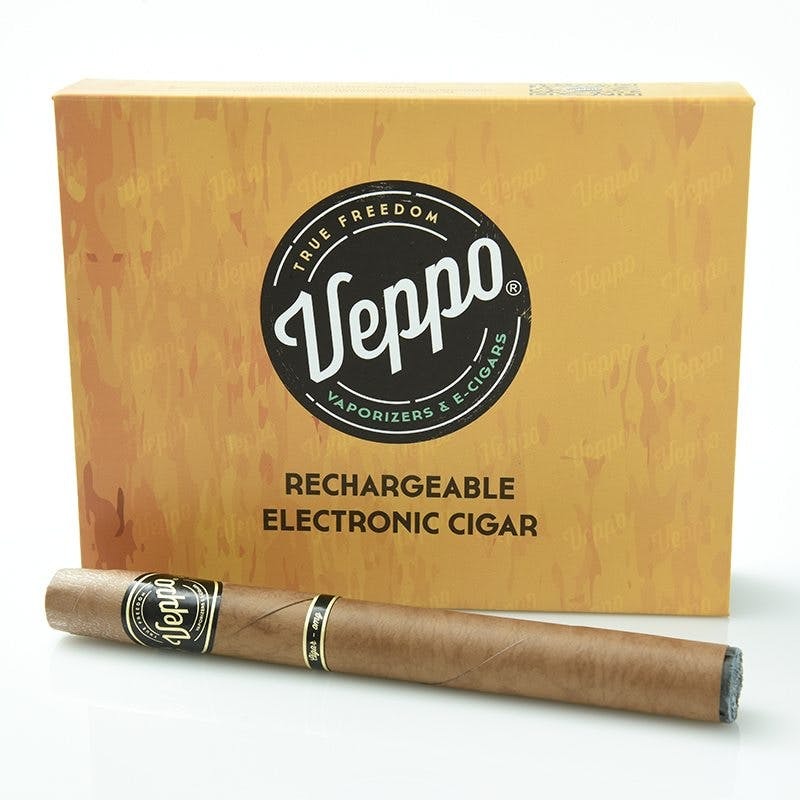 The Veppo Cuban e-cigar is a nifty rechargeable e-cigar with a mild taste and an easy draw. The weight is a bit more substantial than disposables, but that will afford you the opportunity to vape longer. And the Veppo uses a USB male-end for charging that also doubles as the connector to the cartridge. You never have to carry around a plug. All you need to charge your Veppo e-cigar is anything with a USB port. The Cuban does not taste like a Cuban cigar per se, but it does a good job of approximating the taste of one without all the nasty ash, chemicals, and unhealthy smoke. Veppo offers a decent range of other products that can pair with their e-cigars, or as general “e-cig” vapes. If you are looking for an e-cigar vendor that focuses mostly on e-cigars, Veppo may be just what you are looking for. Two types of e-cigars are available for purchase: disposable and rechargeable. A disposable e-cigar is exactly as it sounds. After a limited number of puffs, the cartridge of e-juice has been vaped and it is then thrown away. Disposable e-cigars are perfect for the occasional user to take to the Saturday night poker game, or vacation to Las Vegas. They are also an excellent choice for those who wish to try an e-cigar, but are not yet committed to switching from traditional tobacco cigars at this time. First time users can pick up a variety of disposable e-cigars for a very reasonable price per item. Those who wish to use their e-cigar often would benefit from purchasing a rechargeable kit. For those who wish to make the switch to vaping over smoking, or perhaps for driving to and from work each day and who don’t want to destroy that new car smell, a rechargeable is the better option. It has a USB or similar port and may be plugged into a wall charger when the battery gets low, just like a cell phone–and more often than not, again, like a cell phone, you can use it while it charges. The types of batteries used in e-cigars generally last for about 300 charging cycles. And with most e-cigars being able to get you through the majority of the day without needing a recharge (if it’s rechargeable), that should work out to about a year before you may need to invest in another.